On July 16, 1964, 15-year-old James Powell was shot and killed by NYPD Lieutenant Thomas Galligan outside 215 East 76th Street. Off-duty, Galligan witnessed the boy horsing around with others and a building superintendant in Manhattan's Upper East Side. He fired two shots at Powell after claiming that the boy lunged at him with a knife. News of the murder shifted attention from the three missing civil rights workers in Mississippi, and two days later, protesters marched to Harlem's 28th Police Precinct, only to be met by a wall of police. A riot ensued, closing 125th Street between Third and Eighth Avenues, leading to days of violence as residents fought police. Stores were robbed, cars and buildings were set ablaze, and 465 people were arrested. The number is contested, but roughly 500 people were injured and one man was killed during the riot, which resulted in between half a million and $1 million in property damage. 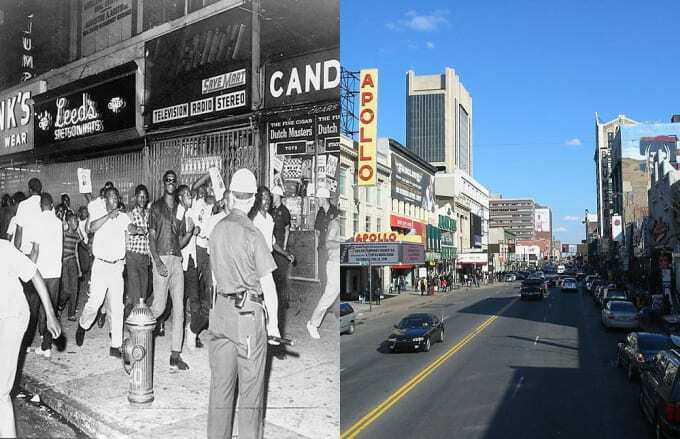 In modern day Harlem, 125th Street is also known as Martin Luther King, Jr. Boulevard. Located within this same area that was once closed are the famous Apollo Theater, the office for the William J. Clinton Foundation, Touro College of Osteopathic Medicine, and various retail stores.